The Chinchorro reef is a protected reef system, but also an important fishing area for pink conch and lobster. 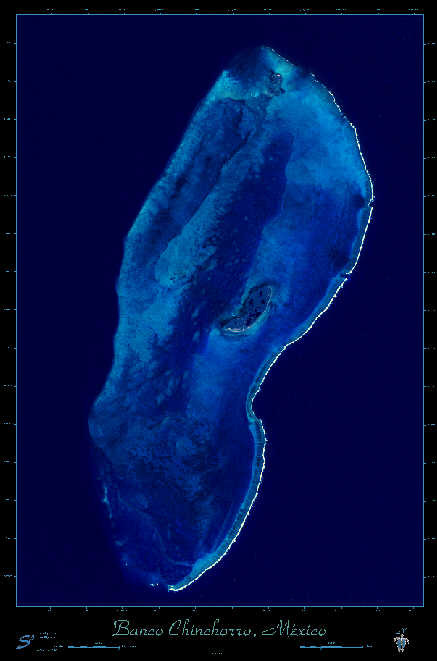 Chinchorro is an elliptical reef off the coast of Quintana Roo (See sattelite poster image below). It consists of the islets of Cayo Norte, Cayo Centro and Cayo Lobos. It is the best preserved of all the large nucleus of coral reefs found in the waters of the coast since it lies furthest away from the coast. The reef has been converted into a biosphere reserve in 1996 with the objective to promote the sustainable use of its fishing resources. The reef varies in depth from 3 feet to 3000 feet, making it dangerous to ships but a boon to sport fisherman and divers. It is estimated that there are over 200 ships that have sunk in the area, but many are very old and hard to recognize due to the rapid grown of fauna. Most of the dives are in the 35-65 feet range. The diving is spectacular with large blue sponges, and sea walls full of life. A trip to the Chinchorro takes planning as it is 30 miles out, and permission must be granted in advance from the port captain. 24 hours is usually sufficient. Dive options and prices to Chinchorro Banks. Advanced reservations required, Bring Dramamine if you are prone to sea sickness, the trip is 1.5-2 hours each way. Chinchorro Reef: Article by Mundo Maya -- this site has good information on the Chinchorro. Dive Mexico's Barrier reef: Gorps quick review of Chinchorro, but a nice picture of coral. Protected Marine areas: Description and map of the protected reserve. World Wildlife's involvement in the Chinchorro : the World Wildlife Fund (WWF) considers it in the global 200 priority areas.